Seventy-two years ago, President Franklin Delano Roosevelt, in response to the “dastardly” surprise attack on Pearl Harbor, and speaking on behalf of himself and the people of the United States, addressed the U.S. Congress and requested a declaration of war on Japan, propelling our country into the throes of the Second World War. 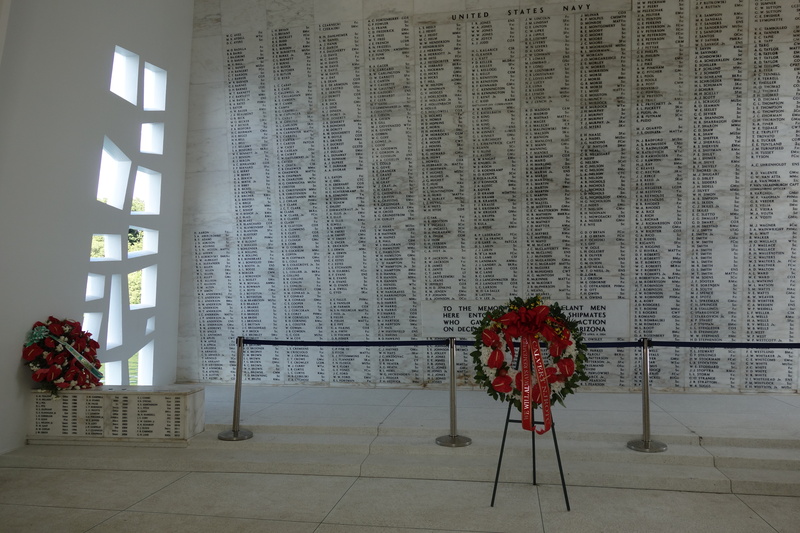 Today, the memory of that infamous day lives on with tributes of solemn respect at Pearl Harbor–part of the collective World War II Valor in the Pacific Monument in Hawaii, California, and Alaska. 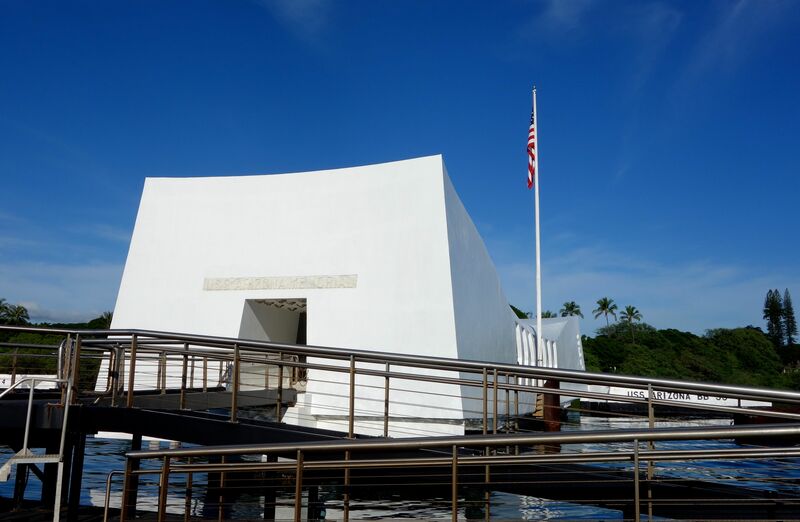 The most visited site is the USS Arizona Memorial. I was one of 1 million visitors this year and was fortunate to experience it just two days before the 72nd anniversary of the attack. Morning on the windward coast of Oahu. 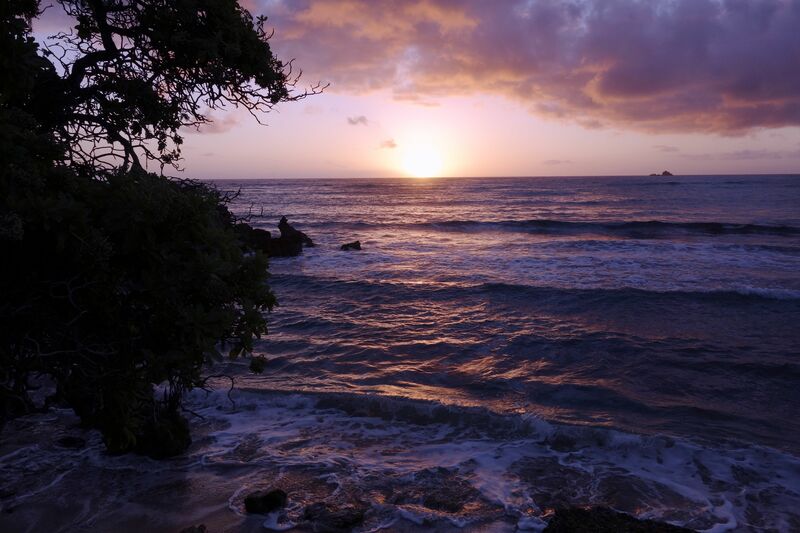 The sun has only been up for half an hour, and it tints the tropical sky with oranges, pinks, and purples. My friend Odile and I want to arrive early enough to avoid the expected crowds. We receive our tickets for an 8:30 entrance and have plenty of time to wander the Visitors’ Center. Standing by the water’s edge, I gaze across the harbor to the USS Arizona Memorial– a symbol of the beginning of America’s involvement in WWII. To its left is the last US Navy-built battleship–the USS Missouri, where Japan’s unconditional surrender signaled the end of that devastating war. 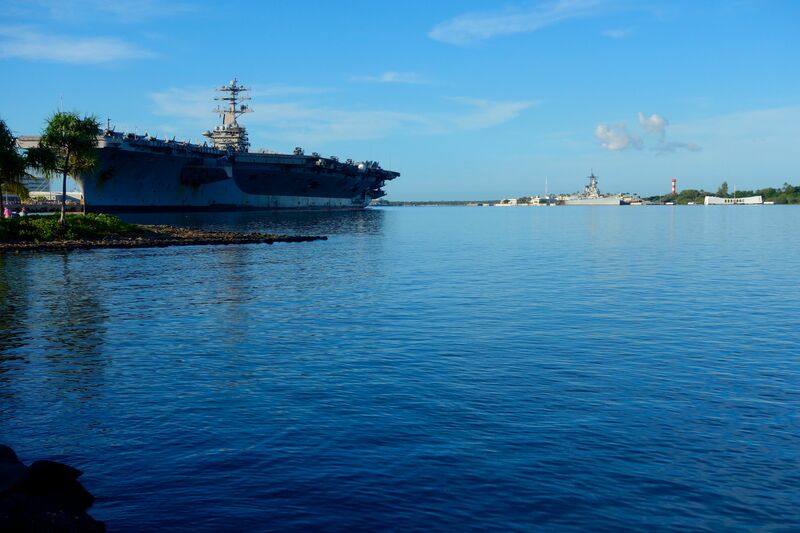 And across from that is the supercarrier–the USS Nimitz, temporarily docked in this harbor and a contemporary example of ever-present US military might. Even though it’s still early in the morning, it seems unusually quiet for a touristic site. No one walks with impatience, faces look pleasant or seem lost in thought, and people are using their “inside voices” despite being outdoors. 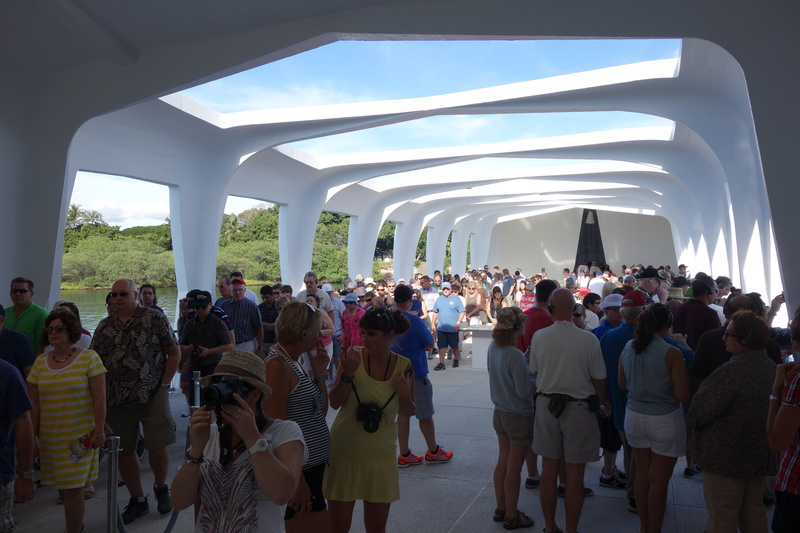 We go to the holding area to await the start of the half-hour documentary that depicts the attack on Pearl Harbor, and even there, with 150 of us gathered, a beautiful calm filters through all of us. Nearly everyone in the room–save some little ones–remembers vividly the terrorist attacks on the US in 2001. But most of us here have no living memory, let alone a solid understanding, of what happened during WWII–it’s distant, long ago, not of our generation, and frankly, not a contemporary concern. But we’re all here because we want to learn, and the documentary helps us tremendously. Historical background about the US’s mutually beneficial relationship with China; Japan’s goals for imperial expansion into China, Southeast Asia and Oceania; Japan’s quest for natural resources; the US’s efforts to deprive Japan of oil and other resources; and the resulting need for Japan to remove the US’s military threat to their plans of conquest puts much of the story in context. Stark and up-close historical footage of the December 7th air strikes and torpedo detonations pierce our hearts and puncture our minds with eerily vivid detail. They transport us to a time when, without warning, lives were violently taken, and our country changed forever. 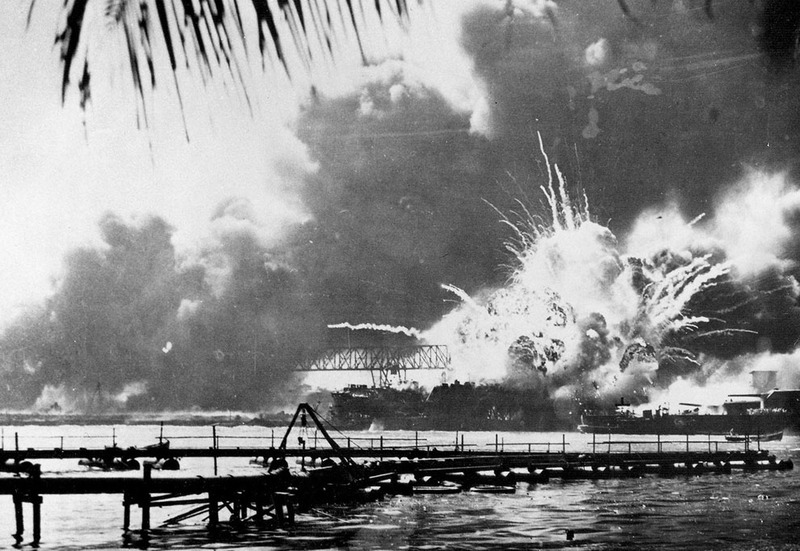 The widespread damage inflicted on the US Pacific Fleet at Pearl Harbor (not to mention the damage done by Japanese attacks that same day in Malaya, Hong Kong, Guam, Wake Island, and the Philippines) was so absolute, so precise, and so lucky on the part of Japan. On our part, we had a series of unfortunate choices. We were prepared for sabotage from an amphibious assault but never for a surprise aerial attack. Planes sat on the airfield wingtip to wingtip, absent of any artillery payload. When a Japanese midget submarine was detected (and then destroyed) early in the morning, no further action was taken. And when radars detected a massive influx of fighters, the radar technician was told, “Don’t worry about it” by a lieutenant who erroneously believed they were US fighters returning from training in California. 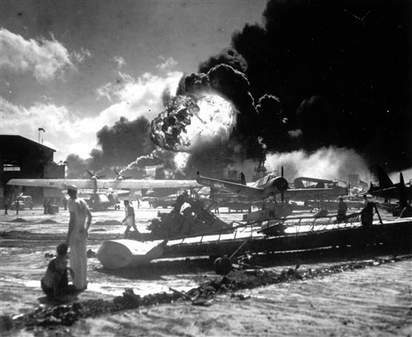 Two waves of Japanese attacks consisted of 103 bombers, 40 torpedo bombers, 129 dive-bombers, and 72 fighters. They destroyed 6 of 8 battleships (the remaining two were damaged), 3 destroyers, 3 light cruisers, 4 other vessels, and 164 planes (128 more were damaged). Almost 2500 servicemen and civilians were killed, 1200 were wounded. The Japanese Imperial Navy, in turn, lost only 4 midget submarines, 29 aircraft, and 64 men. Fortunately our heavy carriers were out at sea and therefore avoided destruction. Japan succeeded in neutralizing the US Naval Pacific Fleet, but it galvanized an American public who wanted justice…and vengeance. We declared war on Japan. Because of their alliance with Germany and Italy, those two countries declared war on us (although we likely would have ended up at war with them in any case, given their actions in Europe at the time). Four years of war stole the irreplaceable lives of military personnel and civilians on all sides. And if we believe that all life is precious (and I do happen to believe that), then we must understand the pain of any person whose loved one is killed in war…even if they are “the enemy”. Silently we empty the theater to board the vessel that takes us to the memorial. When it was built, critics said Alfred Preis’s bridge-like structure resembled a “squashed milk carton”. The architect’s intent was to evoke a sense of the initial defeat but ultimate victory in WWII. To me, it is beautiful, provocative, serene, sorrowful, hopeful, simple, and bold–all at once. It’s a perfect place for solemn reflection. 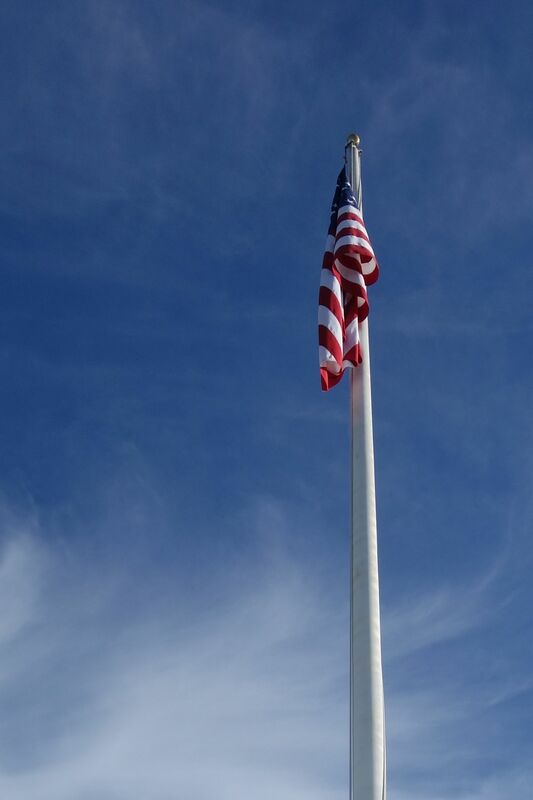 Symbolism permeates every aspect of the memorial, and what you may not recognize consciously with your eyes, you surely register subconsciously in your mind, and more profoundly, in your heart. 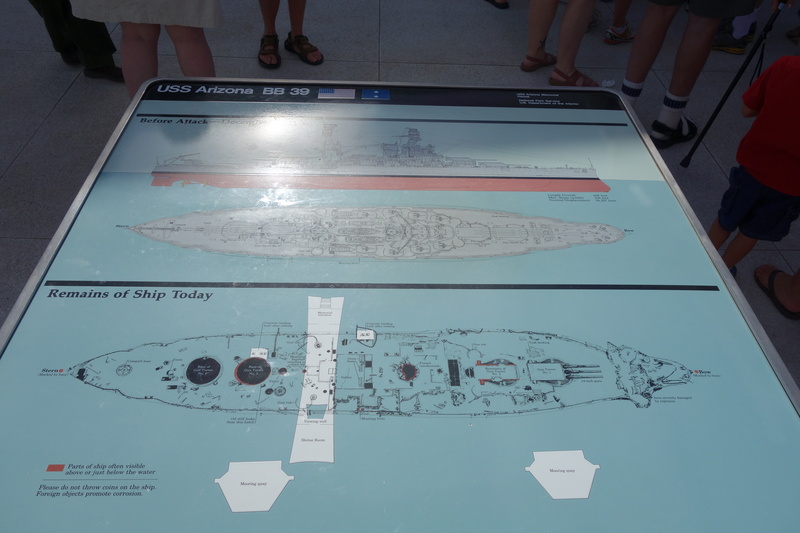 A diagram of the sunken vessel and the memorial that straddles but does not touch it. The assembly hall of the memorial, with its three sets of seven windows, invites solemn reflection and hope. Positioned perpendicularly to the hull of the sunken vessel below, this memorial stands proudly and respectfully above the watery tomb of about 1000 sailors whose bodies were never recovered. As I make my way from the entrance to the assembly hall, I notice the openness of the structure. There are seven windows to my left, seven to my right, and seven above me. I suspect it’s an allusion to the date of the attack (December 7), and when I ask the park ranger about it, she confirms it and adds that the total number of windows–21–is rumored to be a visual symbol of a 21-gun salute. 1,177 names of sailors of the Arizona who perished on December 7, 1941 and carved in stone and are flanked by two sets of Tree of Life windows. 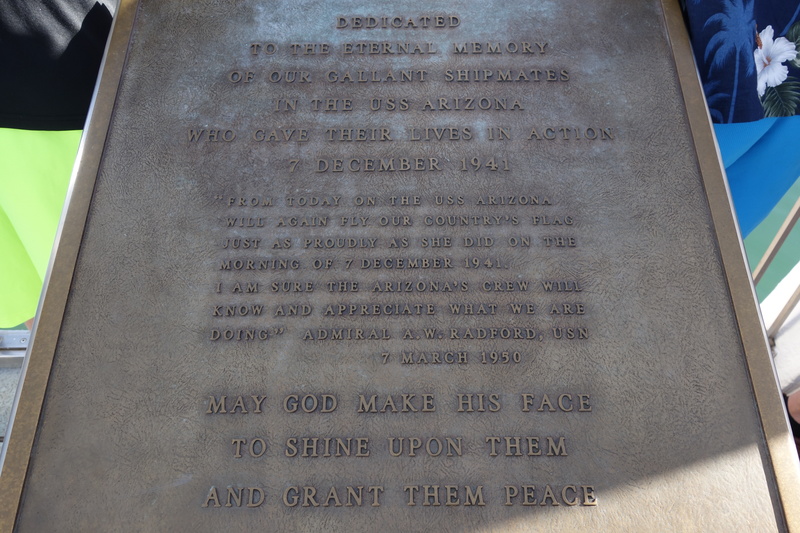 At the far end, a shrine features the names of the 1,177 sailors of the USS Arizona who died in the attack. Windows in that room are metaphors for the Tree of Life, reminding us that even in death, there can and must be renewal. This idea of growth and new life repeats itself in the waters below, where the green of the algae intertwines with the rust of the battleship’s hull and fishes of all kinds gather and find nourishment. As you look down into the waters, you can’t help but reflect on the life and death below you and to contemplate your own reflection of humanity. 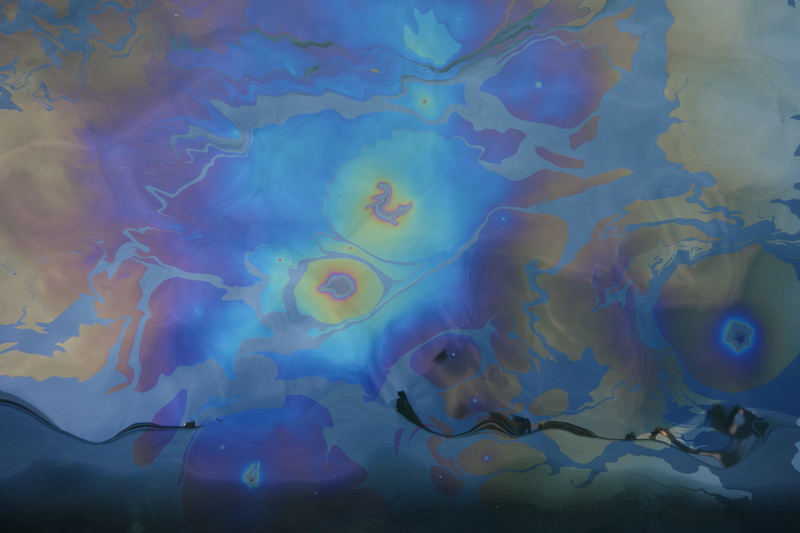 Oil from the USS Arizona becomes a hauntingly artistic and beautiful reminder of war, pain, loss, and renewal. And still one more remnant of this destroyed vessel makes its constant and continually evolving presence known. It reminds each of us that the past really is never that far and is always a part of us. 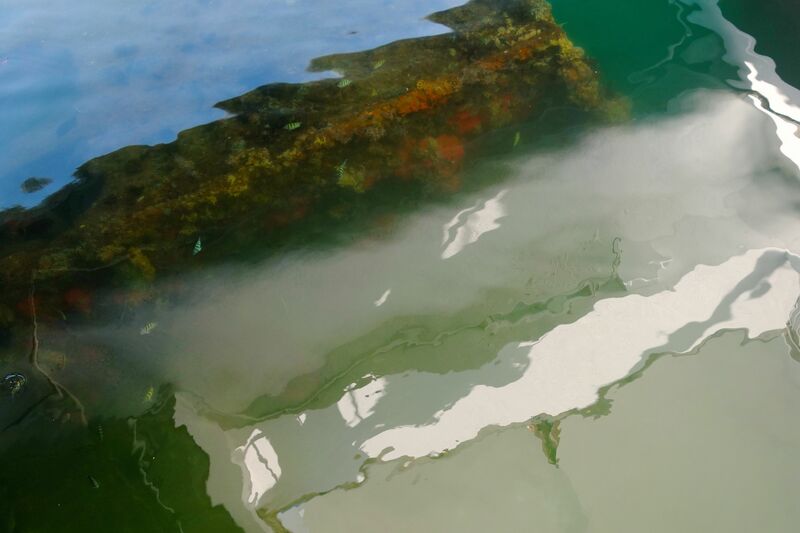 Oil from the USS Arizona continues to leak into the waters of Pearl Harbor. And while it poses a threat to the sea life it infests, it has a strange and wondrous elegance. Swirls and circles of onyx and rainbow tones sway amoeba-like on the water, and they hypnotize me. I think to myself, “Nature is the greatest artist,” and then I remember that it was Man that produced and destroyed what was here. But perhaps Nature, in its wise and masterful way, is doing its best to help us make sense and beauty out of war and pain. 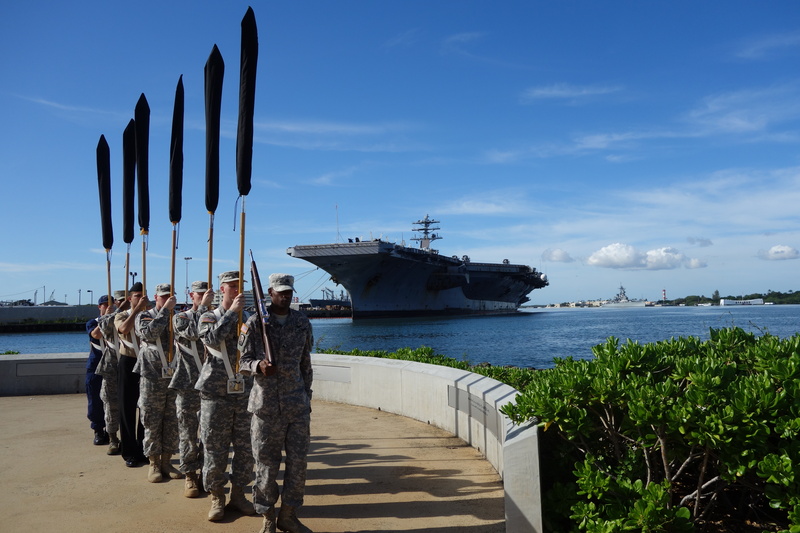 A color guard stands at the ready as they prepare for the 72nd anniversary of the attack on Pearl Harbor. Back at the Visitors’ Center, a military color guard stands at the ready, practicing for the anniversary events to be held in two days. I can’t help but say a small prayer that we always strive for peace and diplomacy in all our interactions with other nations so that these boys (and they are just boys), their fellow colleagues, and their counterparts around the world never have to suffer as their predecessors did in so many previous wars. 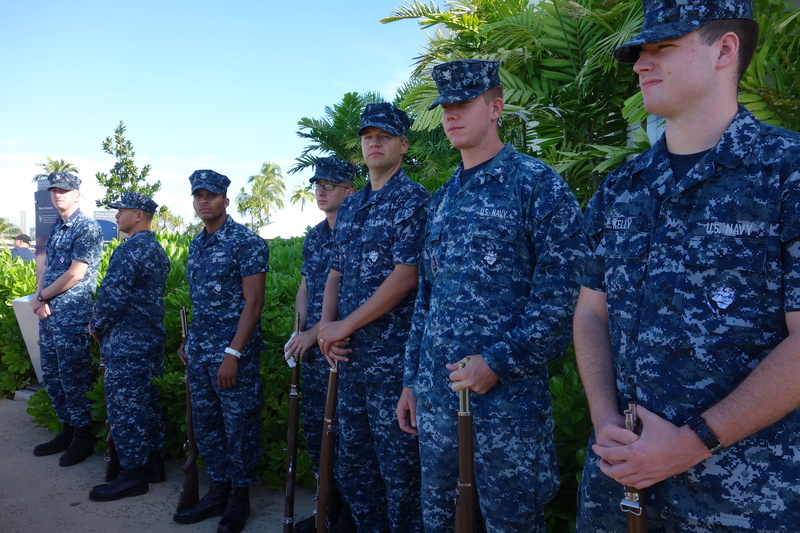 These soldiers take respite in the shade before practicing their 21-gun salute duties for upcoming the anniversary ceremony. This was a very simple way of explaining something very important. I thank you for helping to keep our thoughts alive! Thank you for reading the article, Kimberly. I’m glad you enjoyed it. Wow. You shared how a memorial can bring people to a higher level of understanding and appreciation. That’s the mark of an effective memorial. Thanks for the reminder of a date that should live in infamy.